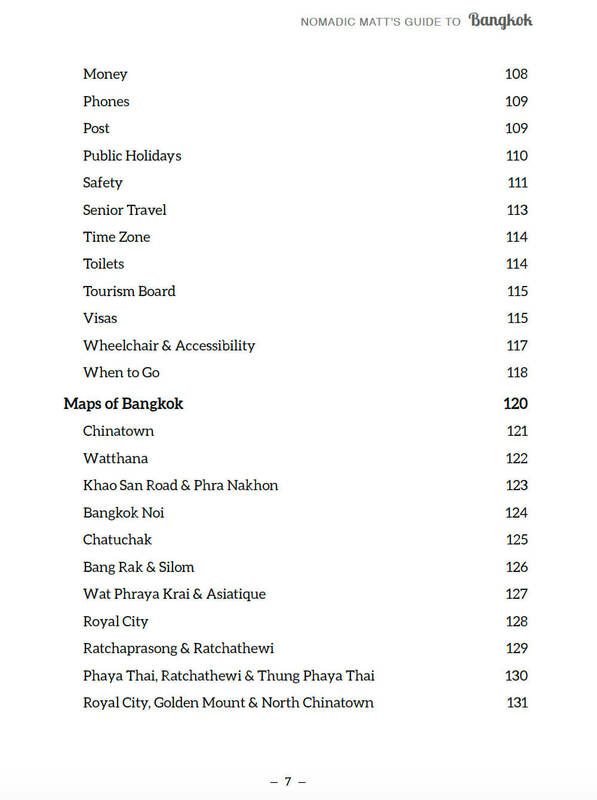 Wondering how you’re going to get around Bangkok or make the most of your visit? Are you worried about getting stuck in tourist areas? Getting scammed? Or eating at the wrong street stall and getting sick? Crowded and chaotic, Bangkok is often mischaracterized as a place with only temples, massage parlors, barely any tourist attractions, chaos, traffic, pollution, and parties. 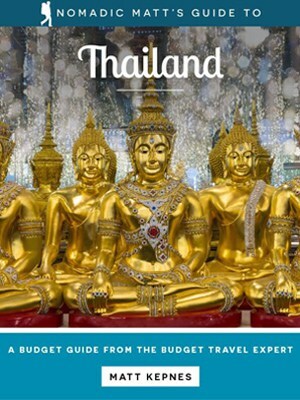 Most visitors never get past that image because they get caught up in the tourist / backpacker trail, and, in doing so, mostly use Thailand’s bustling capital as a hub for travel around Southeast Asia. I have watched Bangkok change, grow, and expand. 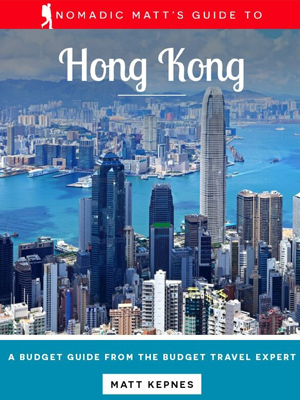 I know it like the back of my hand and used my personal experience to write this direct and straightforward guide so you can visit this exotic city like a local, avoid tourist traps, and save money. 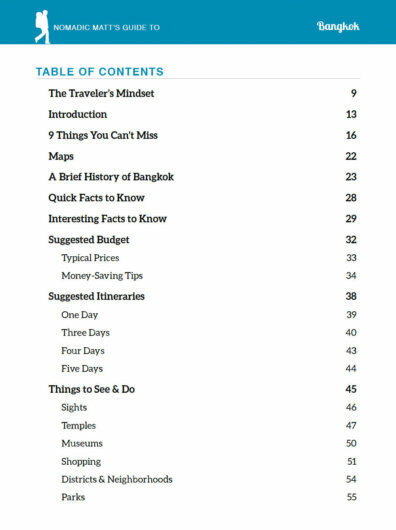 I share all my best tips, tricks, and secret spots so you don’t have to make rookie mistakes like falling for the tuk-tuk temple scam or being overcharged for a riverboat cruise. You’ll see the local side of the city as I take you off the tourist trail and show you Bangkok’s inner world. You’ll get to off the beaten path, away from crowds, and see the local side of Bangkok visiting my favorite sights, restaurants, bars, and attractions! 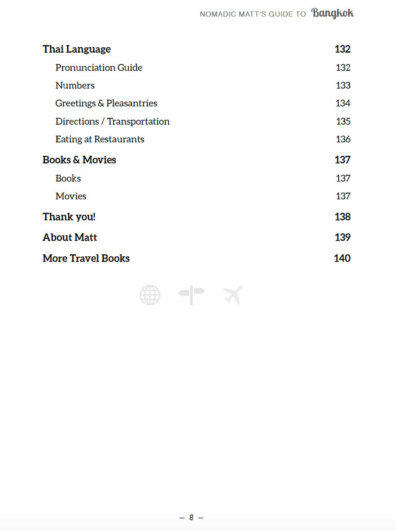 This guidebook is available in two formats, digital ebook and Kindle. 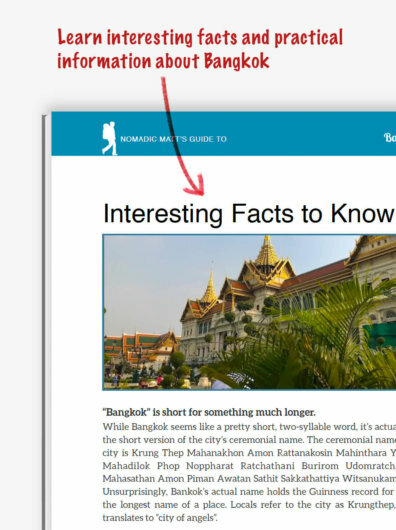 Once you complete your purchase, we’ll instantly email you a link to download your book. This ebook will work on any device and can be used on as many as you want. 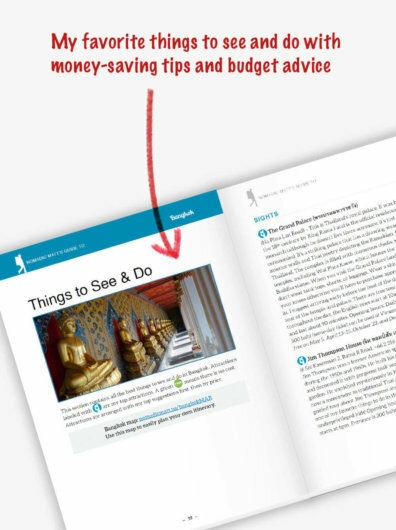 Budget advice – Use these money-saving tips and suggested budgets. 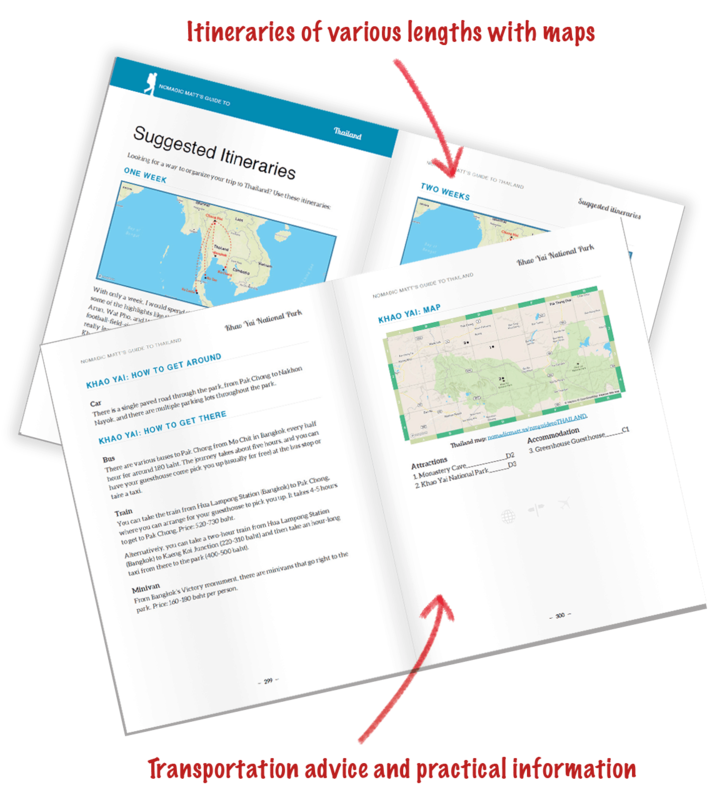 You’ll learn how much you’ll need for your trip and ways to make it last longer! Suggested itineraries – Get two-, three-, and five-day itineraries to make planning and navigating as easy as possible so you don’t miss the really great stuff. 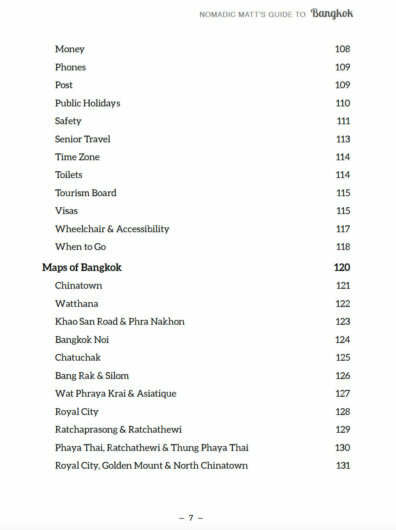 Neighborhood information – Get the lowdown on all of Bangkok’s neighborhoods: where to go and what to see. Learn where to stay, where to eat, where to shop, and where to avoid! Nightlife tips – Get away from all the tourists and hang out with locals and expats with this nightlife list featuring bars, clubs, outdoor beer gardens, and cocktail lounges. If I know anything, it’s where to get a good drink! Restaurant suggestions – Get all the city’s best street stalls, markets, and restaurants, from my favorite pad thai vendor to the best sushi and best soup and everything in between. Don’t settle for crappy noodles in the backpacker mecca of Khao San Road! Related books and movies – Get inspired for your trip with these incredible books and movies about the City of Angels! 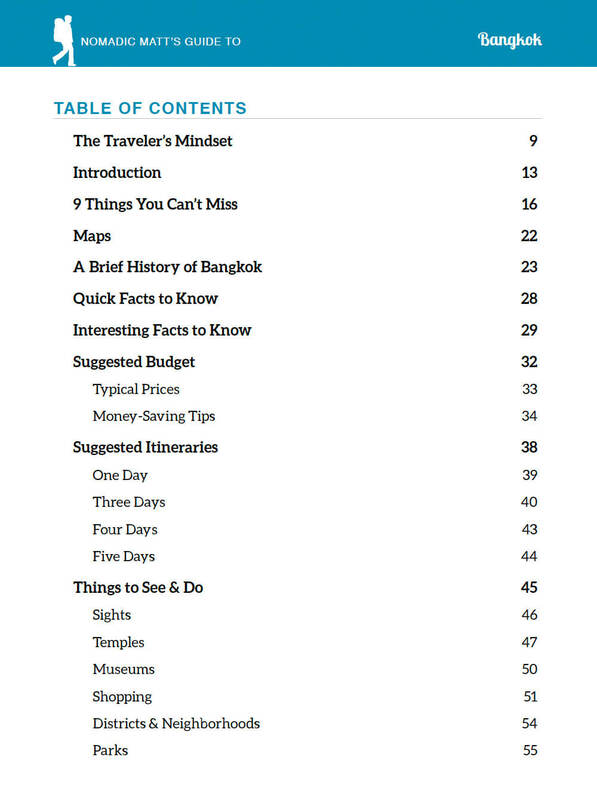 The best things to see and do – Explore Bangkok’s unique, beautiful, inexpensive, and overlooked sights. I suggest unique things to see and do that aren’t found in the other mass-produced guides. 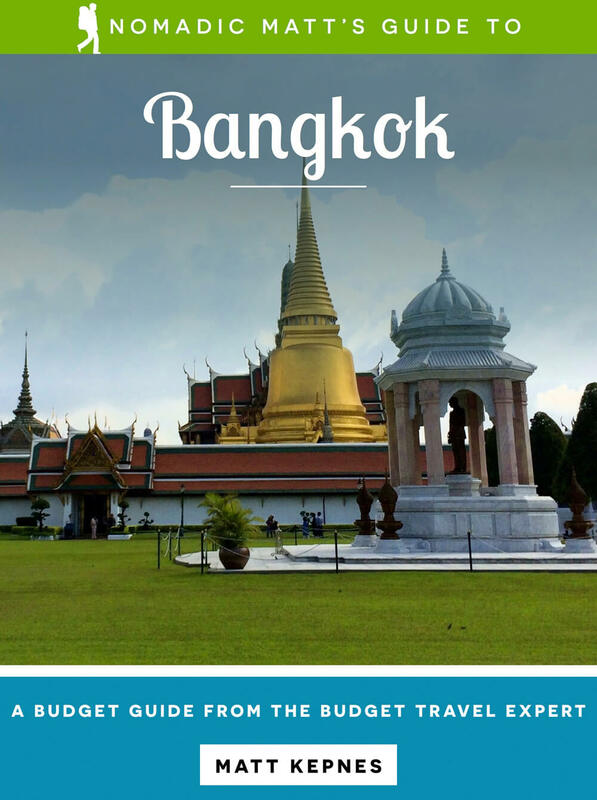 A history of Bangkok – Learn the history of Bangkok and how it became the bustling metropolis it is today. After all, you can’t know a place unless you know its history. Accommodation suggestions – Check out this list of my favorite, unique budget-friendly places to stay, including hostels, guesthouses, hotels, and family-friendly accommodations. 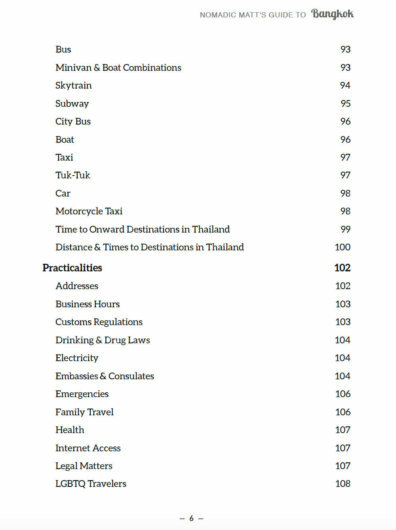 Practical information – No matter how prepared you think you are, things can go wrong and customs can get overlooked. 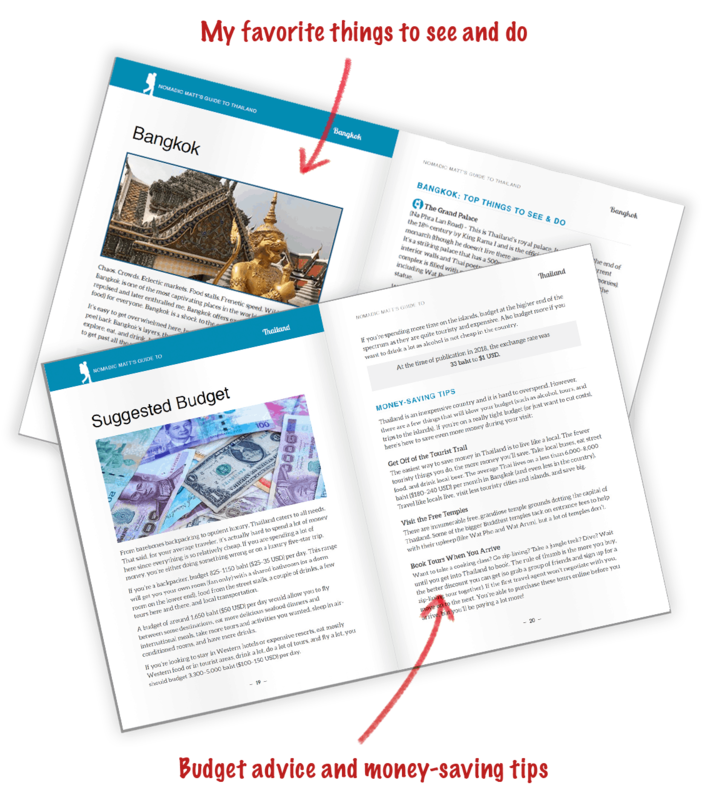 Get the essential tips that make guidebooks so useful: information on tipping, visas, public holidays, embassies, currencies, emergency numbers, business hours, weather, and much, much more. 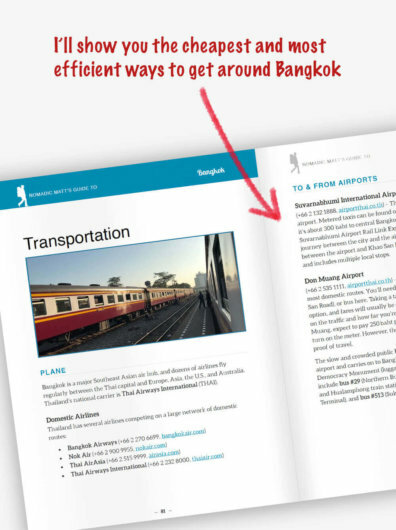 Get the Definitive Travel Guide to Bangkok!! 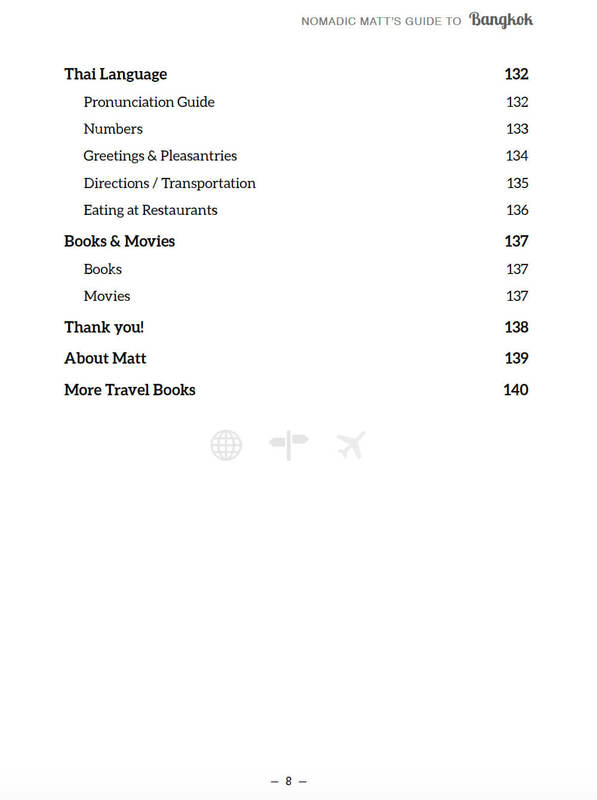 This book cuts out the fluff found in other guidebooks and gets straight to the practical information you need. You can get this guide for your phone, Kindle, iPad, or computer so can access it on the road. 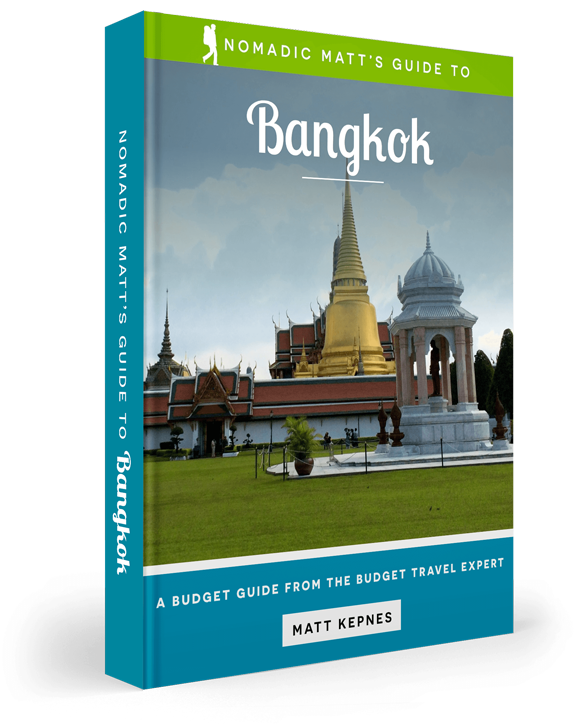 Learn everything you need to know about Bangkok for only $14.99 $9.99 — and save hundreds on your dream trip. What makes your guide different? It caters to budget travelers and helps those previously discouraged by financial budgets to make their travel dreams come true. In addition, all of the information included in this guide is from first-hand experience by a professional nomad and best-selling author. 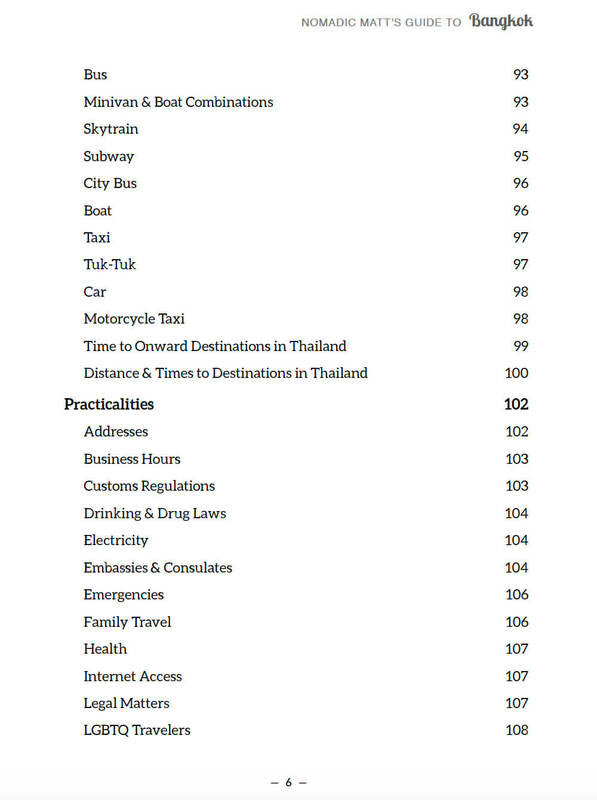 What makes you an expert on Bangkok? I lived in the city for two years and have visited every year since 2004. All of the recommendations in this guide are my personal favorite places to go, see, eat, and drink. 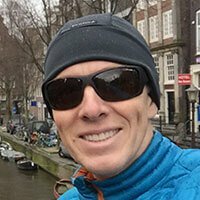 What’s the difference between this guide and the information on this site? 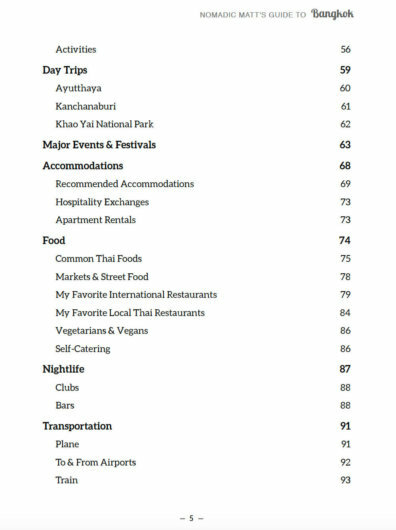 While the website has a lot of good information on Bangkok, it doesn’t offer specific accommodation, restaurant, bar recommendations, neighborhood information, itineraries, and extensive money saving tips. It doesn’t give any sort of background on the history of Bangkok, tell you anything about the culture there, or go over important information like customs, laws, visa, and emergency information. 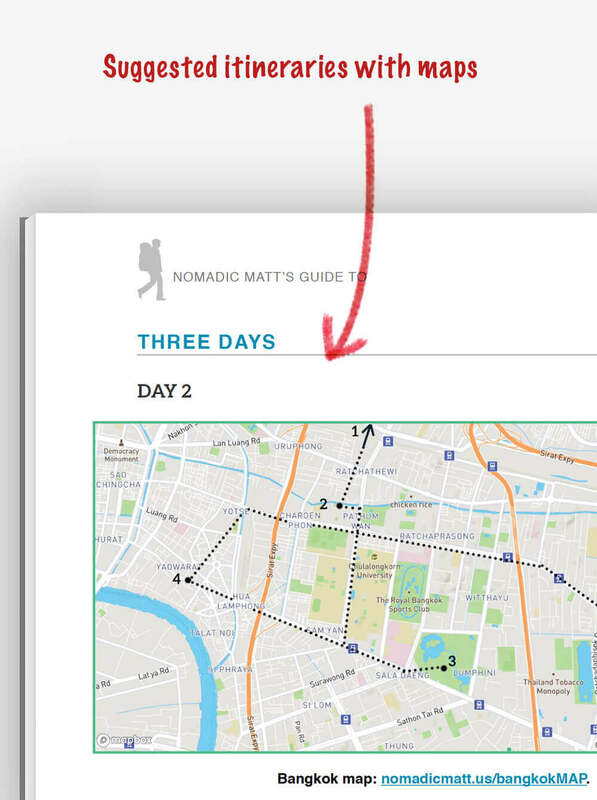 This guidebook goes into way more detail than any blog post can! 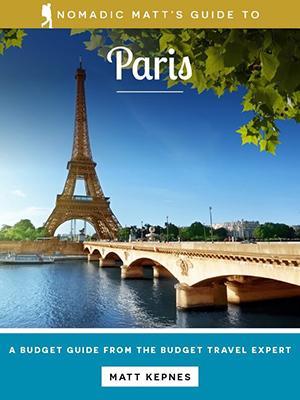 This guide was written for budget travelers by a budget traveler. It includes cheaper options for food, activities, and accommodation, as well as tips to save money while still having a high-quality travel experience. No, it is only available as an eBook or for Kindle. Are there special coupons inside? Unfortunately, there are not. However, there are plenty of tips included to help you save money! If I have any questions or concerns, can I contact you? Of course! You can contact me via email anytime: matt@nomadicmatt.com. How frequently is this guide updated? 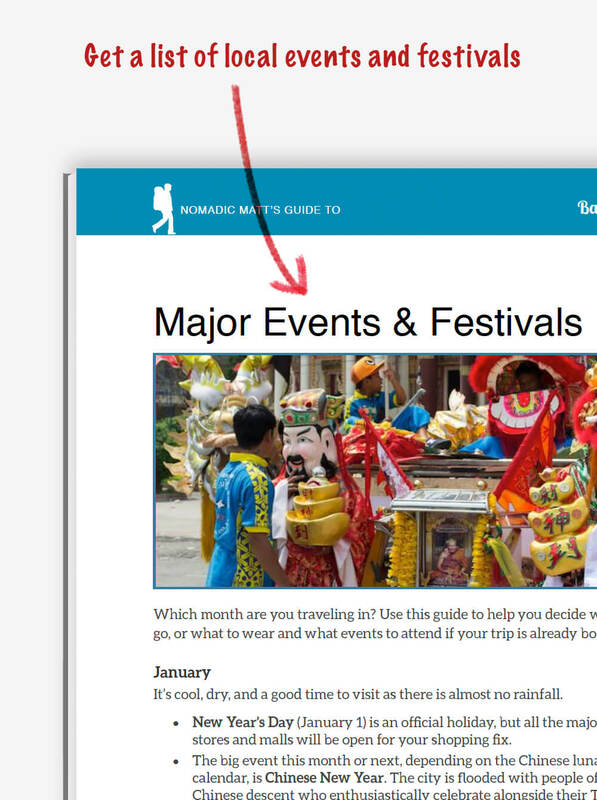 This guide receives a complete front to back update twice a year. However, when we receive updates from readers, we push them live immediately so information is always as up to date as possible. See more of Thailand for less! I’ll show you how to get off the well-trod tourist travel path, and have a fun time that yields a deeper understanding of the country, its people, and culture. 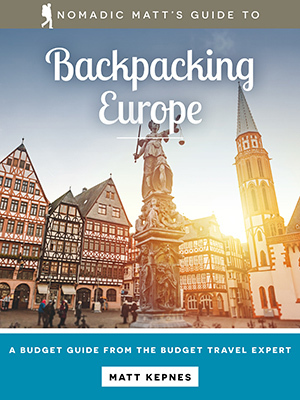 I wrote this guidebook to give you an overview of how to plan an extended trip around Europe so you get all the information you need in one, easy to reference place.